I was looking for a quick and easy floral display to put on the table for Thanksgiving, but the only fresh flowers remaining in my garden were fall mums and a few late blooming calendula. Added to the bright orange of a small pumpkin, though, this combination of warm fall colors made a vivid impact. If it is too late in the season to gather flowers from outside, use dry floral foam and pop in a few silk flowers, in vibrant autumn colors, to get the same effect. Remove the top of the pumpkin with a sharp knife and scoop out all the seeds and stringy membranes. Wash the seeds and set them aside for use in some of these Roasted Pumpkin Seed Recipes. 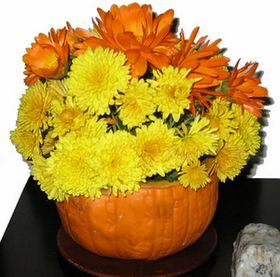 Cut a brick of Oasis floral foam to fit inside the pumpkin. Note: At this point, you can decide to place the foam directly in the pumpkin, as I did, or find a bowl that will sit inside the pumpkin and place the foam inside the bowl. I’ve had people tell me that using a bowl, or another waterproof container, helps keep the flowers fresher and the pumpkin from going moldy. I’ll likely try it with the bowl next time and see if that is a better option. Add water to the pumpkin and let the foam absorb it; I was surprised at how quickly the water soaks in. Begin inserting flower stems. I wanted the orange calendula in a central line across the display so I began with the largest of these, placing it right in the center. Continue adding flowers, holding each stem up to its approximate position, then trimming the stem, if required, to achieve a uniform height. Keep in mind that you will be inserting part of the stem into the floral foam, so each sprig or single flower will need to be that much longer than the exposed length. If some of the flowers don’t look exactly as you envisioned, pull them out of the floral foam and reposition. I did this several times to get a nice mound of flowers that looked good from all sides. There you have it: an easy pumpkin vase that would look equally good on a porch side table, or your Thanksgiving dinner table. As of this moment, I’ve had mine on display for three days, topping it up with water each morning. Tomorrow, I will probably remove the calendula, which is getting past its prime, filling in the space with a few more yellow mums. If the display lasts a week, which I think it will, then I’ll be quite pleased as it was far cheaper than buying a fresh floral display from the market or the florist, and a wonderful way to display garden flowers right into the fall.